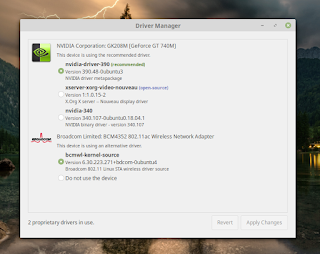 ryv's blog: Review: Linux Mint 19 "Tara"
Review: Linux Mint 19 "Tara"
Since I changed jobs and no longer use my big Linux box day to day, it's been harder to find the time to work with Linux, and in particular Mint. I love Mint and I've been delighted to use it for many years now. When I took my work PC home, and fired it up I was poignantly reminded how much I enjoyed working in the Linux desktop world and how I'd missed it. Windows 10 just doesn't compare and even Mac OS X (while very good) still lacked a certain something. I've been using Mint 18 for some time and enjoyed it, so when I finally caught up to checking out "Tara" I was very interested to see what the go is. Here is the link to the release blog post about it: https://blog.linuxmint.com/?p=3597 It's a Long Term release (LTS) so it'll be good until 2023. I've found Mint to be updated and looked after for the full term of their LTS releases - something to commend the team on. Now, what to run the test install on? I managed to get my hands on a 4 year old HP ENVY TouchSmart Ultrabook (or "Sleekbook" 14-k124tx is the model) for this review. It's stats are fairly impressive for an older machine: Intel Core i7-4500U, 8GB RAM, 128GB SSD drive. It has a touch screen, and dual video adaptors (low power Intel and nVidia for the good times), and multi touch mouse pad. This one had a dodgy Windows 7 install on it that kept blue screening, even with a fresh install of Windows 7. I've been running Mint as my primary workstation on it for several days now with nary a worry. I booted into the LiveUSB version of Mint for a quick poke around. Everything looked the goods so I chose "Install". The installation of Mint was flawless - it identified the UEFI nature of the boot system, and asked if I wanted to change it around, or was I happy to blow away the previous install and just go with Mint. I let it get rid of Windows and move through the familiar installation process taking the default options for everything. I like how it is specific about the encryption option for the disk leading to a more secure install. First boot was not long after and very fast - particularly on this rather lean little machine. The initial impression was that the presentation of the desktop environment was polished and had the usual, rather plain theme applied. I'm more than happy with this though as I find too much flash gets in the way of doing what I need to. The new crop of desktop backgrounds are lovely - lots of colour and sharp imagery to enjoy. It was very fast too - launching Firefox took mere moments and everything was quick. I was delighted to see the operating system ask me if I wanted to set up backups when I first tried to run Mint Update. This is a very clever idea and uses a built in wizard to run the flamboyantly named "Backup Tool". Not only will this use rsync to back up one's files, but it will also backup your software selection (and restore both groups of files as required). Given this computer is a test bed and I expect to mess around with it a fair bit, I didn't bother setting it up. The initial update was smooth and a quick reboot got me back into a fully patched machine. In the background you can see one of the superb "Tara" backgrounds. 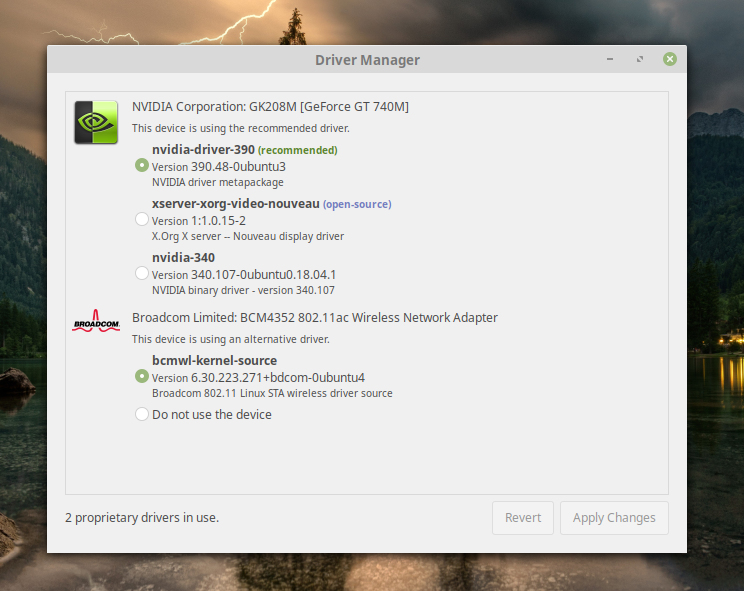 Everything works now - WiFi and the nVidia drivers as well. I'm not sure if there really is a boost in the graphics as I'm only doing desktop stuff on it (and even then mostly web based activities) so check out a gamer's review for that sort of thing. Another quick reboot (now up to 3) and good to go. Installed Chromium, nmap and a few other bits and bobs and all good. Mint is effortless to manage apps with - much like Debian and Ubuntu and this is a big part of the reason I like it. You can see that it's only 11GB for the whole install, and applications (and also my imaginative naming scheme for computers!). With regards to usability and stability - Mint offers the usual round of suspects for desktop productivity - LibreOffice, VLC, Transmission, Firefox and the like. In the last few days of using Mint on this machine, there have been zero issues, no failures, no stoppages. This is on a machine recently removed from our fleet for stability problems! It wouldn't make a day without a BSOD on a fresh Windows install. Pretty good! Anyone who reads this blog knows I'm not big on fancy pictures and stuff, just the meat of my thoughts and for what its worth - Mint is great. I was very happy with 18 and it's variants, and thus far, I'm very pleased with 19. For older computers, for computers kids will touch or for people willing to try something new, it is my choice for a Windows or Apple alternative. In fact, even if you're a power Windows user, it might be worth putting the ISO onto a USB and Live booting it for fun and seeing what it can do. Over a USB3 connection and a USB3 thumb drive it's very usable. The install from there is fast and simple. I've since upgraded my home PC to Mint 19. The desktop PC experience is every bit as good as the laptop experience and the straightforward in place upgrade from 18 to 19 was easy. There is a lot to love about this install from a user perspective. Get around it!